When it comes to online executive education, many people are still on the fence. They don’t know if the experience will be the same as traditional on-campus education or if their corporation will accept their online education with the same magnanimity. At IE Business School’s Madrid campus, the IE online Global MBA program has been looking to change that attitude with the WoW Room. What Is the WoW Room? 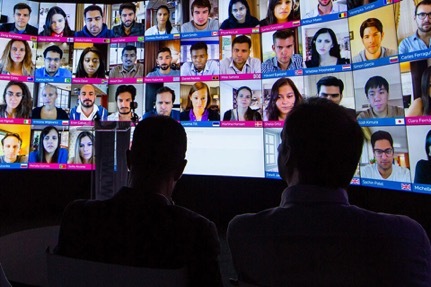 Launched a little over two years ago in October 2016, the WoW Room—Window on the World room—is a virtual classroom comprised of a 45 square meter video wall made up of 48 monitors arranged in a U-shape. This curved lecture theater mimics a face-to-face classroom environment, seamlessly allowing all students to interact with each other and the faculty as if they were sitting side-by-side. The WoW Room takes online teaching and learning to the next level. A professor, either physically present or projected as a hologram, stands in the center of the room and their likeness is captured and projected to everyone in attendance. And similar to a physical classroom, the professor isn’t regulated to a small 1×1 square; they are able to walk around and approach students individually while remaining on camera. The idea behind the WoW Room is to allow students to connect and collaborate no matter where they are as long as they have an internet connection. And the best part is the technology works using low broadband levels, so students aren’t required to have fast connectivity or fancy devices to make it work. It works on any device at any time and provides a futuristic learning space that transforms the online MBA experience. And if you think the Window on the World Room is just a giant computer, think again. It has many features that make it even more interactive than a normal classroom. “The great thing about a virtual classroom is that your students are already in a digital format, which means you can run algorithms that recognize patterns in facial expressions to assess understanding and identify students’ emotional state and levels of attention in your class,” Professor Martin Boehm, dean of IE, told FT.
Each student is filmed using motion capture technology that captures every moment. In this way, students and faculty can move freely in the space while still staying in the frame. This means that the professor can see students’ faces in a close-up and dynamic way while also paying attention to larger movements such as a raised hand. This allows the professor to ask a question and get real-time engagement from individual students. The motion capture technology in the WoW Room also works for the professor. The room is set up with an automatic and motorized camera that follows the professor’s every move. This means that no matter how much they pace, they remain on the screen, so students can follow along. The Window on the World Room also has the ability to recognize emotion, which allows the professor to simultaneously evaluate the students’ level of engagement and respond to them individually. This means that when a student is bored or unengaged, the virtual classroom recognizes the problem and alerts the professor. In this way, students and faculty experience deeper immersion in the classroom that keeps everyone engaged and interested. Another key feature of the WoW Room is the collection of big data and the ability to perform analytics using Graphtext, Contexto.io, and other programs. This takes the room beyond classroom learning. 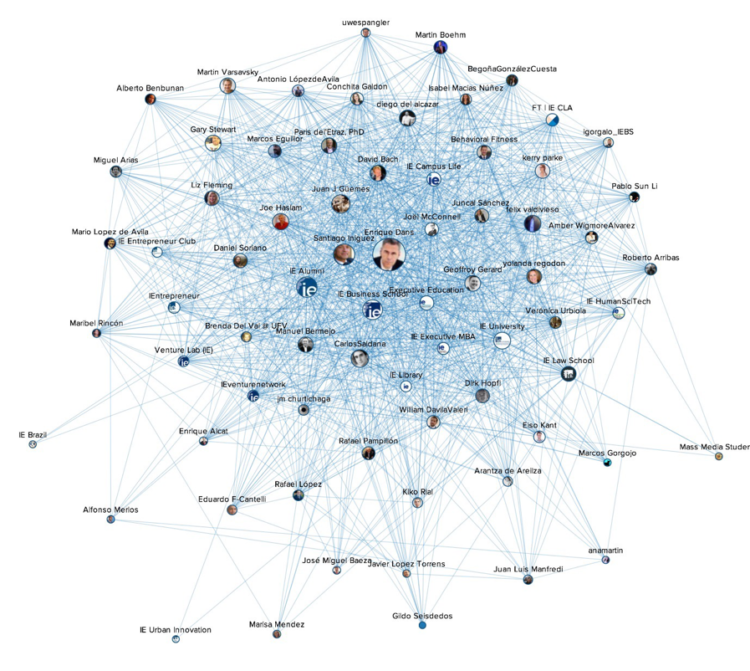 Using the system, you can search for influencers on social media to learn more about the structure of the community discussing a specific topic or product. This also allows you to collect data on centrality and relevance, links, influences, and more. From there, you can analyze a community clearly, and using the monitors, you can look at a global perspective or drill down into detail while still offering the high visibility of a large screen. “Seeing these graphs in such a huge monitor has obvious advantages that justify the use of the WoW Room, offering students visibility and a level of understanding of what’s being analyzed way beyond what a normal classroom situation would offer,” wrote Dans. And, in the classroom, big data can also be gathered and used in real time. The professor can carry out surveys and/or voting during the lecture to do an analysis on what everyone in the class things. This is a great way to provoke conversation, determine levels of interest, and gain a deeper understanding of pertinent topics. The hope of the Window on the World Room is that it will be the future of blended learning. The experience that the room provides mixes face-to-face learning with synchronous methodology and video conferencing to provide the best classroom experience possible. The goal is to bridge the gap between face-to-face and online learning, using the digital world to replicate and improve the real world.